Need someone who knows your system inside out? We are experts in the Technology One Core Enterprise Suite*. How we make your systems work better for you. Consulting, project management and expert advice to ensure you have a successful implementation. You can rest assured your implementation will be smooth and stress free. Expert advice to enhance your system. You can feel confident that you’re getting the most out of your system and spend your times on the things that will help your business grow. Bespoke training that is tailored to your needs. Teaching you how to find your way around all the features and quirks of the system. We make sure you never feel frustrated with your Technology One system again. Your personal team of system admin and security experts. We take care of your system administration function for you so you can focus on the strategic and value-add tasks that really matter. User acceptance testing from all angles. Our team of experts test both the end-user and back-end configurations. We do the heavy lifting to ensure the testing phase is quick, complete and pain-free. Once we’re done, you can feel confident that the system will work for you. Personalised reports across any area of your business. We can extract and present the data that matters to you – so you can make the best strategic decisions for your business and your customers. Uncovering opportunities for system optimisation. Our experts review your system to ensure you’re getting the most out of it. An actionable list of optimisation strategies will give you a roadmap for a complete system tune-up. Making sure your licence structure if right for you. We help you save money on unused or unnecessary licenses and ensure you are getting the most out of your system investment. You can be confident your license structure suits your unique needs. We offer these services across the whole Technology One Core Enterprise Suite. The Green Cloud Consulting team is extremely diligent, proficient and professional. They go above and beyond and are truly client focused. We have had a few challenges over the past few years and they don’t shy away from a challenge but work with us to find workable solutions. They have excellent knowledge of the TechnologyOne products and have proven their determination and perseverance time and time again and assisted us to meet our deliverables. I enjoy working with this dynamic team would recommend them to anyone who needs more control over and transparency with their TechnologyOne systems. We work with a broad range of customers from local councils to private enterprises and charitable organisations. We’ve also helped businesses like Loan Market, QIC Limited, Jellinbah Group, NIB Health Funds, Kina Finance, Internal Revenue Commission, Queensland Airports Limited and PCYC NSW, as well as local councils in Toowoomba, Isaac region, Inverell Shire, Blacktown, Canada Bay, Ku-ring-gai, Livingstone Shire and Sutherland Shire. Technology One Core Enterprise Suite* experts. Our team of independent consultants provide expertise across a spectrum of Technology One* products including Finance, Budgeting, Business Intelligence, Performance Planning, ETL, Publisher and HRP modules. Our directors have a combined forty years of experience across accounting, audit and business consulting. 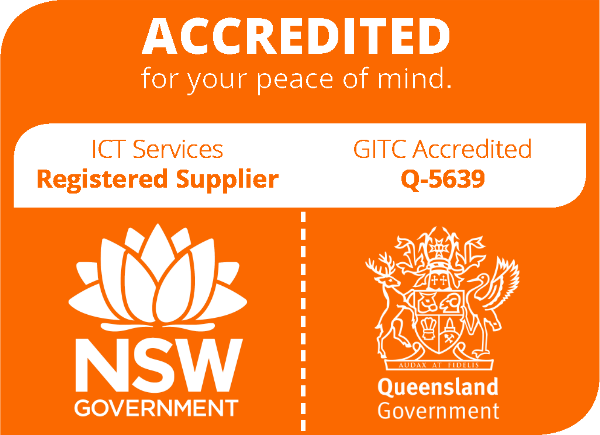 We are a registered ICT supplier for the New South Wales Government and GITC Accredited for Queensland Government. It makes working with us easy. * Green Cloud Consulting Pty Ltd is an independent consulting firm and is not affiliated with Technology One Limited. Green Cloud Consulting is not a reseller of Technology One Products.